Are you in the process of building your own team? This episode talks about the benefits of having a team, the process of finding the right people and training them, the misconceptions and some things to remember. 00:46 – Why build a team? 02:33 – What are the benefits? 07:30 – How much should you pay? 09:49 – Do you need a full-time VA? 10:56 – Are you ready to be a boss? Lead by example. [Click To Tweet]. Show me your men, and I’ll show you the leader. [Click To Tweet]. James Schramko here, and today on SuperFastBusiness.com, we are talking about building your virtual team. In today’s episode, I’m going to talk about why entrepreneurs need to build a team, the benefits of having a team, what you need to do first, how to find the best people, training your team. I’ll also cover some common misconceptions in building a team, when to hire, and some core value discussion. Plus I’ll give you a few things to remember, and a couple of mistakes to avoid. All of these in this episode of SuperFastBusiness. Why do entrepreneurs need to build a team? It’s simply a case of you running out of capacity. You’d want to be spending most of your time on your highest value activity and you’re going to get about 180 hours a month, maybe 200 or 300 if you push hard. And that’s it. After that, you run out. Now assuming that you’ve got important things to do, you’re going to have to find other people to do the things that you don’t want to do, you can’t do, you shouldn’t do, or that you can’t scale. So if you want to focus on the things that you are truly world class at, then you should hire in team members who are world class at what they do. Now this might be an internal hire, it might be someone who works for your business, either full time, part time, or as a contractor, or it might be you using an outside company, a supplier as such. And that still counts as building your virtual team, even if they’re not employed directly by you. You’ve just got to recognize that you should not be doing some of the most basic tasks, like building your website, or setting up opt-ins. These things are the type of activity you could easily get someone else to do. For example, we have a website development service. You could easily have us build a website for you and install it so that you could get on with what it is you do. And the same applies for other tasks such as copywriting, content writing, publishing, search engine optimization. And then there’s other stuff outside the business, like accounting, legal, lawn mowing, cooking, shopping. There’s a lot of things you can have someone else do if you want to get it going. But in terms of the online, virtual team, then this episode is really going to help you. Let’s talk about some of the benefits of having a team. You can do things that you’re best at, and let them do everything else. You’ll pay an amount that gets you the results back, so if you can grow your business to the next level in revenue, then you’ll still make more profit. You bring in the revenue, you pay out your costs, and your profit is there, but you didn’t do as much work. This in turn brings up your effective hourly rate, and I’ve mentioned this in a few other podcasts. You’ll build up something bigger than what you can create by yourself if you have a team. You can only get so far by yourself. In fact, most entrepreneurs will struggle to make more than low to mid six figures all by themselves. It’s just at that point you need to bring in an assistant, and then a website manager and a content person, a project manager, etc. to scale up. Now here’s what you need to do first. You need to figure out what business model you have, and then what needs to get done. An exercise that might be helpful is this: list down every single task that happens in your business, or that has to happen in your business that’s not happening right now because you’re doing everything. Then write down what sort of roles you need to be able to complete those tasks. And then assign the tasks to those roles. It simply could be done with Post-It notes on a window or on a desk. So just to repeat that, list out every single task that needs to happen in your business, and then write down the roles that you would need to manage those tasks if you group those tasks. Once you’ve identified the tasks, then you should find a contractor or a supply service or hire someone to give that task to. You move it from you to a supplier or an employee. Again, this allows you to work on the role that you need to. Everyone else does all the other stuff. So how do you find the best people? The absolute best way to build your team is through word of mouth referrals. This is a good starting point. Talk to someone in your industry who’s got a good referral. Ask them if they have someone who’s got experience, who got them great results. Doing this will eliminate a lot of the potential risks of hiring the wrong person. There are entire teams of people who respond to job advertisements on jobs boards with the same Web spam that they want to work for you, but they’re really just recruiting you for their services, and they do this en masse. You want to weed out those services. That’s why word of mouth referral, from people who have already delivered a good result, is the best starting point. Now if you’re taking on team members, it’s very important that you put in the effort in the beginning. You have to hire people and train them yourself, and after that you can set up standard operating procedures and then assign a person to take over the training. It’s really a two-step phase. Step 1, you’ve been doing everything. You transfer that knowledge to someone else. Step 2 is that person, now the custodian of the standard operating procedures, can help you train the next person. Now if you want to find out more about this topic, I did a wonderful interview with Sam Carpenter from Work The System. We talked a lot about standard operating procedures. I’ll link to those in the show notes as well. Everything can be completely automated after that, including the entire recruitment and training process. For this step, you’d have to have a strong training system and a really good quality team in place to ensure that every task gets easier. In my business, we know when we scale that we should requisition a job, and then we can recruit for that job and bring someone on board, usually via word of mouth, and then we can train them. And this all happens without my involvement. Let’s talk about some of the common misconceptions in building a team. Number one is, some people think you can hire a magical remote worker who’ll automatically know everything, and will be able to do anything and you’ll never have to do any work anymore. And it’s simply not the case. It will take years to develop the kind of culture where you will have someone who knows everything and can do anything and that you don’t have to actively get involved. And I’d say that that’s going to take somewhere between 3 and 5 years of working with the same people. Certainly in my business, at the 5-year mark, with the current team I have and in the business that I was working at before in Mercedes-Benz, after 5 years you get very, very solid skills and very good rapport, as long as you put in the work and the training upfront. But there are not magical Swiss Army Knife workers you can just pluck off a shelf who will automatically know everything. You’re going to have a phase of getting to know you, synchronizing your preferences, your likes, your dislikes, your decision-making style, your management and leadership style. Here’s another misconception, is that you just pay peanuts. Some people think, when it comes to pricing, that you can pay like a dollar an hour and these sort of low wages. If you’re going to pay the minimum, you’ll probably get the lowest bidder, and the least able person to do the job, the most desperate. And they probably can’t afford to live off just one job. They certainly won’t have a flushing toilet or food on the table for some of the low wages that are talked about out there. Here’s a better solution. Pay well, and pay on time. This can go a long way. It makes things run smoothly, and it removes animosity and also cultural challenges. If you’re always paying on time, and you pay well, then at least you’ve done your end of the bargain, and you can expect to have good performance in reciprocation. In our business we have a saying, a fair day’s work for a fair day’s pay. I’m not expecting someone to work their guts out for a slave wage, and at the same time I’m not expecting that I’ll pay a good wage and get a poor performance. There’s an expectation that is evenly matched. Because anything that is out of balance for too long will break, and that’s how we’ve managed to keep our balance with a large team for so long. And I know from friends and from listening to other people talk, there’s a lot of problems around people not getting paid. It’s the fundamental sin of an employer to not pay on time if your employee is doing the job right. Number 3 is about respect. Just because your team will call you “Boss,” and they are very polite and they might use words like “sir,” it doesn’t mean they respect you. Aside from the formalities, which are purely a cultural and environmental thing, you’ve still got to earn the respect of your employees. Be willing to roll up your sleeves and show your team that you’re prepared to do things as well as the things that they’re doing. Lead by example. There’s some famous sayings in the military that go along the lines of, “You show me your men and I’ll show you the leader.” And that’s pretty much about you’ll get the team that you deserve. And if you think you can just sit back and bark off orders, you’re not really going to gain much respect. And people won’t extend. Misconception number 4 is that you actually need to hire a full-time virtual assistant or a direct hire. In many cases, entrepreneurs can be hiring a specialized service provider to do one task on a pay-per-job basis and then not have to worry about the training, managing, monitoring, protection against fraud, checking against reputation, trust issues. Some people are just not cut out for management, and if that’s you, that’s fine. Just hire services who specialize in the thing you need done, whether it’s build a website or do SEO. In fact, that’s one of the most common ones where people break this rule. You’re not going to hire a really low wage virtual assistant full-time who’s going to be amazing at SEO. You’re better off to hire an SEO company who have a research and development facility, who have been doing it for years, who get great results, who are very efficient and effective and who require no input from you. It’s better to go and pay for a contractor than to hire full-time unless you really think this is a permanent situation. And if you think you can do better than the experts. Misconception number 5 is that “I’m a manager and I can handle a team.” Well, as a boss, you’re responsible for someone’s wage. It’s a shame when you hire someone and you have to let them go because of mismanagement or poor leadership because you can’t even keep enough profit from your business to pay your team. If you’re a manager, you’ve got a big responsibility when you’re hiring. And you’ve got to sustain your business so that you can actually come through with your end of the bargain. Can’t see the link to the Slack review! Great podcast James. Do you use an online software for your SOP’s? If so, which one? Ok, well that’s simple enough. I just found http://www.sweetprocess.com, which looks sweeet but of course there’s (yet another) cost involved. Me, build a team to do things I don’t know anything about? 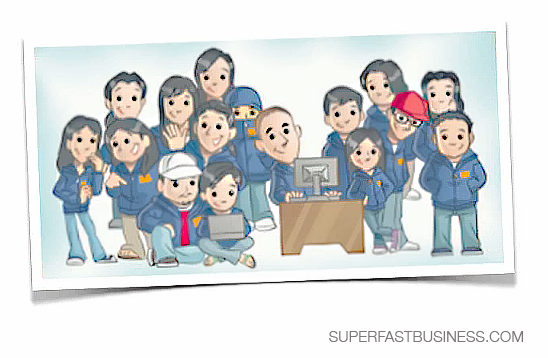 SuperFast Business is my team: They tell ME what needs to be done, and then they do it. It’s lovely. Much of what you say here is for cognoscenti (‘folks who know stuff’). Scaling up … it looks like Mount Everest, so where’s that sherpa? exactly – contracting experienced teams is just like a sherpa for hire. What a visual. I can see you dressed like sherpas do, at cyber-Everest (a mountain of computers and computer-related appliances and equipment. Would be a good ad or a good logo for one of your upcoming projects or groups. Did better than anything else or anyone else. LOL…. took me 30 seconds to find the “play” button. Make it MUCH BIGGER…. if thats the main action you want people to take. You can not stress enough the Work the System part of the process. That is what makes your staff awesome. Great interview with sam carpenter. who do you use in the Philippines for web design?